An eyebrow transplant is a regular procedure that is performed at Kliniek Veldhoven. Many men and women who have almost no hair on their eyebrows are not aware of the full potential of an eyebrow transplant. A hair transplant in this area of the face is completely feasible and can often offer excellent results. 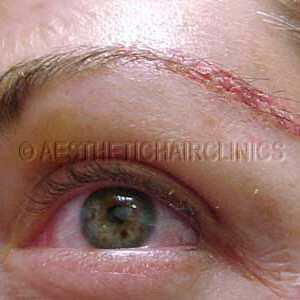 An eyebrow transplant can be performed on people with face burns, or if the eyebrows have been plucked off. Where this is technically possible, it can even be performed on men or women who simply want more hair on their eyebrows. In all of these situations, an eyebrow transplant is certainly a possibility. At Kliniek Veldhoven we regularly treat men and women for this type of “problem”. You use your eyebrows every day when you need to express personal feelings and nonverbal communication with other people. In this picture you can see the result of a successful eyebrow transplant, where an eyebrow of around 150 grafts was implanted. This result is usually achieved in one or two treatments. The newly implanted eyebrows tend to grow after 3 or 4 months. Sometimes a little touch up is needed to perfect the eyebrow. The technique that is used during eyebrow transplantation is almost the same as the FUE technique. The donor hairs are removed from the donor’s head. The surgeon starts by making small holes at the spot where the hair should be. It is very important that the hairs are positioned correctly and placed as flat as possible in the right direction, otherwise the eyebrows can appear quite bristly. Head hair is usually thicker than eyebrow hair, so it is important to use only the thinnest hairs available. The appropriate hairs are carefully put in place by the surgeon. This procedure usually requires between 150 and 400 hairs in order to reconstruct an entire eyebrow. The eyebrow transplant is performed under local anaesthesia and takes about 4 to 6 hours. Sometimes this procedure may take a little longer if more precision is needed, e.g. we may need to pick out the hairs one by one from the donor area using the FUE technique. This is done microscopically using a small drill (with a diameter less than 0.7 mm) which leaves no visible scars. This process is different to the traditional technique, where the FUT healing takes longer and a scar will often remain behind in the donor area. If you are interested in a consultation, please contact us. You can reach us by phone by calling 040-295 42 43 or send us an email.